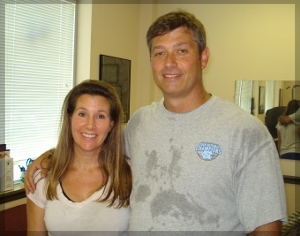 Liza and Drew Howell have been loyal clients since 2007. Busy working parents of four, they have continued to make time to exercise and eat right. Their hard work has paid off. Drew has been able to fight his way back from a serious ski injury and is now able to participate in the sports he enjoys, such as surfing, skiing, tennis and basketball. Liza – a fierce competitor – has vastly improved her strength and conditioning over the course of our time together. According to clinical nutritionist Dr. Robert Rakowski, the top three causes of disease are: stress, toxicity and malnutrition. The top three solutions? Love, education and motivation. Liza and Drew continue to demonstrate the power of love and motivation during our training sessions. They encourage and support each other and have made health a priority: for themselves and their family. They have recently started the BioSignature program and now have the knowledge and tools to achieve optimal results in their overall well-being. Liza and Drew understand the importance of a healthy lifestyle. They are working together towards a goal that will ultimately make them happier, healthier and better partners/parents. It’s been a pleasure working with these two and I look forward to continued success for them both!